Some of the residents of the Long Row. See note below. Photo courtesy of June and Melvin Shepherd. Some of the residents of Long Row. Far left – George Shepherd. 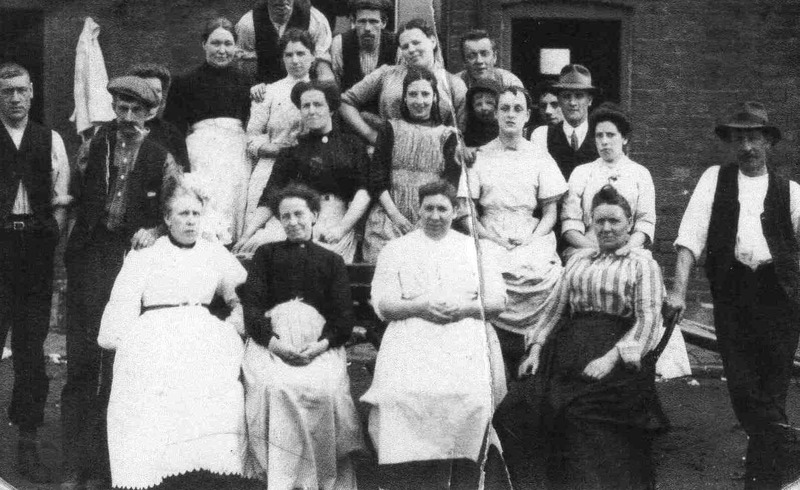 Front row – left to right: ?, ?, Mary Ann Burdett (nee Paulucci), her sister Emma Jane Shepherd (nee Paulucci), and Mary Ann’s husband William Burdett. Does anyone know who the other people are? In reply to Mavis we have calculated that this photo was taken around 1909 to 1912 as the lady who gave us the copy of the photo told us that the young girl in the middle of the 2nd row was her mother Emma Burdett when she was about 10 to 12years old, when she married she was Emma Gee. We have since been able to put a few more names to more faces in this photo,the lady stood directly behind my Great Grandma Emma Jane Shepherd ( nee Paulucci) is my Grandma Annie Amelia Shepherd (nee Johnson) later to become (Lindley) and behind her is my Grandad William Shepherd who died in WW1 in 1917, at the side of my Grandma Annie we have been told it is a Mrs Hallam, on the back row in the middle could be Mr Hallam, next to George Shepherd is Mr Beech/Beach and behind Emma Burdett is a lady called Ginny Whitlam.